Ignore the press release that talks up the "coupe-like styling" and how it has "the sportiest and most progressive design in its segment." We all know the truth just by taking a good look at the 2012 Audi Q3. It's a crossover. And if there's one thing Audi needed, it was yet another crossover. Even Audi sees it. They go on, saying, "Despite its coupe-like styling, the Audi Q3 is clearly recognizable as a member of the Q family." Yeah, ain't that the truth. Upon its market launch, two gasoline engines and one TDI engine will be offered; a second TDI engine will appear a little later. All four of the four-cylinder engines will have a displacement of 2.0 liters. They all deliver great output and terrific torque from 280 to 380 Nm (206.52 to 280.27 lb-ft). In addition, all engines combine Audi's mighty efficiency technologies: direct fuel injection, turbocharging, the start-stop system, and the energy recovery system. The 2.0 TFSI delivers either 125 kW (170 hp) or 155 kW (211 hp). The more powerful version propels the Q3 from zero to 100 km/h (62.14 mph) in 6.9 seconds and on up to a top speed of 230 km/h (142.92 mph). The 2.0 TDI is available with 130 kW (177 hp); a version with 103 kW (140 hp) is to come a little later. Paired with front-wheel drive, the version offering 103 kW (140 hp) averages less than 5.2 liters of fuel per 100 kilometers (45.23 US mpg). Both TFSI engines and the stronger of the TDI units will be supplied with quattro permanent all-wheel drive. Its key element is a hydraulic multi-plate clutch, which redistributes power at lightning speed from the front axle to the rear axle as needed. 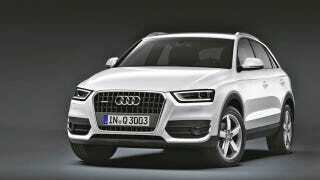 The Audi Q3 — which will roll off the assembly line in Martorell, Spain — will go on sale in June. The price in Germany for the base model will be 29,900 euros. Although I really don't care if it's going to be for sale here in the U.S., we're told — thankfully — that plans for sales here are on hold.